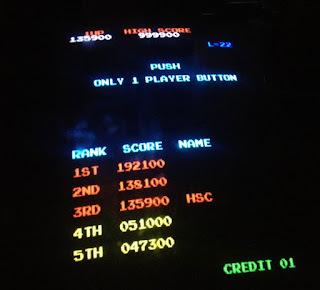 January 12th, 2013 - Just over 24 hours ago, Vincent Lemay scored 1,135,900 points on a "classic red" Donkey Kong arcade machine in an incredible 2 hour, 58 minute performance that officially places Lemay second on the all-time scoreboard... and only 2,700 points behind Hank Chien's 1st-place score of 1,138,600. Lemay has been holed up with the machine for over a week in a back office at the 1up arcade/bar (Twin Galaxies' new headquarters) in Denver, Colorado on an extended multi-day campaign of world record attempts. 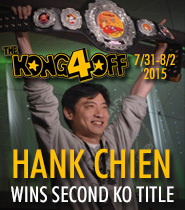 Last November, I predicted that Lemay would be the winner of the Kong Off 2. Unfortunately it was not his weekend, but Lemay is now poised for a more highly-coveted prize: the title of world champion. It may not happen today, or even during the remainder of his stay in Colorado, but Vincent came so close to beating Hank yesterday that there is no longer any doubt that he has all of the skill and determination that it takes to do the job. Now, it would seem, it's only a matter of time. Despite two early deaths on Levels 4 and 5 (automatically grounds for a restart under most circumstances), Lemay had such a solid foothold toward a world-record score that he opted to forge onward into the depths of the game, buoyed by the promise of a strong starting pace of over 1.15 million. 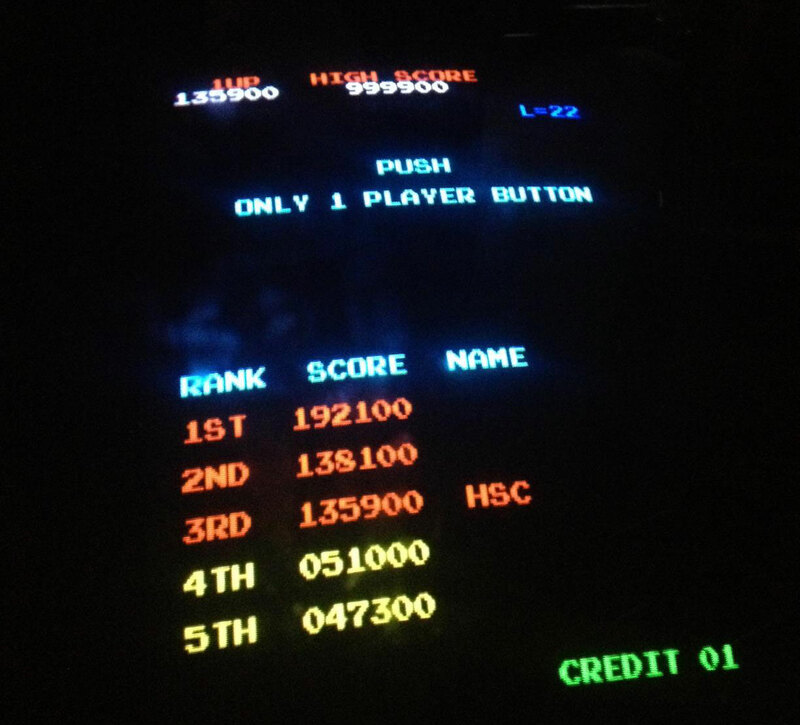 Level 12's rivets screen claimed the last of Lemay's reserve lives, at which point he took a deep breath, reasserted the focused calm he'd been maintaining, and proceeded to carry his final life through over 500,000 points and 50 screens of unforgiving chaos. Going into Level 20 with a total of 1,029,200 points, Lemay would only need an average of 55,000 in the two remaining levels to claim the record, well within the realm of possibility, as Lemay's per-level average for much of the game was close to 60,000. Lemay began to pray in a quavering voice, heart racing and brain awash in a sea of stress hormones, now possibly minutes away from laying claim to the Hope Diamond of competitive video gaming. 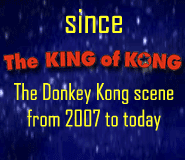 Unfortunately, Kong chose that moment to play dirty. The first screen of Level 20 was a quagmire of hard-to-group barrels and a dangerous ascending fireball that spooked Lemay and forced him to play it safe, finishing the screen with only 9,000 points (his worst barrel screen for the entire game). Since a barrel screen can offer up to 14,000 points (around 12,000 being the typical goal for a modern world record attempt) this came as a huge hit, but Lemay remained confident. "If I need to upgrade my pace, I will," he said. Then came that level's elevator screen (20.4), which was downright cruel: the screen's "guard fireball" was almost freakishly uncooperative, eating up enough of Lemay's bonus timer to leave him with a paltry 4,300 points out of an approximate maximum of 7,000. All told, Level 20 netted just 50,200 points. With one level remaining, Lemay would need 59,000 points to become the new champion. It was still possible, but in the end, it proved to be too much of a stretch. If those two screens on Level 20 (or even just one of them), had gone as they normally would have, today the world would be toasting a new Donkey Kong world champion. We will have to wait. 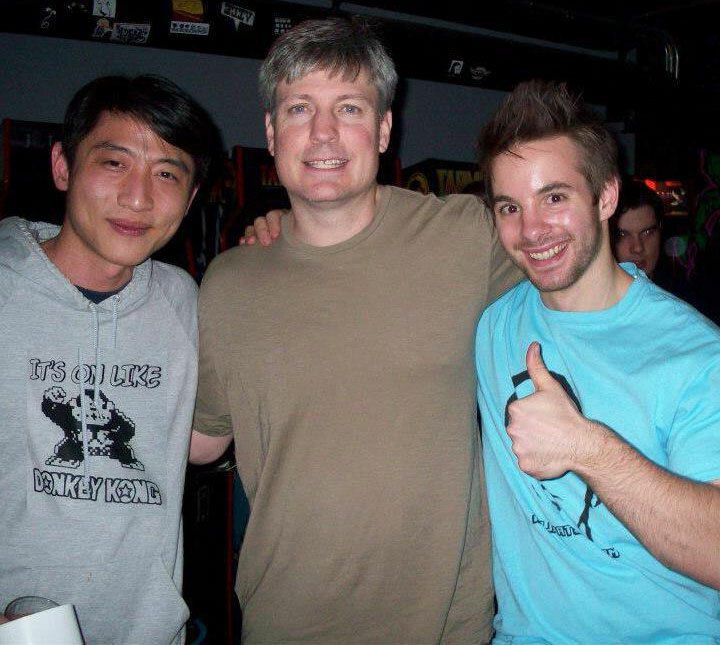 When Twin Galaxies' Donkey Kong scoreboard (finally) lives again, it will feature three players—Hank, Vincent, and Jeff Willms—with scores over 1.1 million. 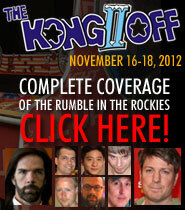 Dean Saglio will be in 4th place with his 1,079,400 score from the Kong Off 2. That will leave Steve Wiebe and Billy Mitchell in 5th and 6th place. Since Lemay is finally in the arcade standings with an officially-verified score, now the Donkey Kong elite are all present and accounted for there, and the torch has been fully passed to the new (and last) handful of world record contenders. Indeed, shortly after the Kong Off 2, Wiebe gave Lemay his blessing to "go beat Hank." 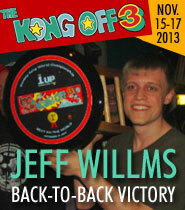 As for Billy Mitchell, he made it evident with his solid-but-unengaged play during the tournament that he has almost certainly put Donkey Kong behind him, and is no longer interested in competing at the level to which the record has been pushed. The "Billy vs. Steve" era has passed. Welcome to "Hank vs. Vincent". When the game was over, Lemay didn't take even a minute to feel disappointed at just how close he came to the crown only to miss, expressing great satisfaction with the performance and his new 2nd-place standing. But then, with attainment of the record now a matter of "when" and not "if," why should he waste time on regrets? History is waiting, Vincent. Press start. For anyone with questions about Vincent or Donkey Kong, he would like to invite you to his Facebook page. CANADIANS ARE GONNA KILL IT ALL!!! HAHA! Congrats to Vincent! Way to go!